Welcome to artists Barry Elz and Joel Schoon-Tanis’ Open Door Studio, a place of serious play. In the light-drenched space of Holland’s former public high school, Schoon-Tanis’ vibrant and loose paintings vibrate next to Elz’s serene and muted landscapes. Peopled with lions, giraffes and barnyard animals set in sun-swathed pastures, Schoon-Tanis’ work pulls you in like an oft-told fable. While his work may ring of the familiar, he brings a clear-eyed freshness that has garnered attention and accolades far beyond his backyard of Holland, MI. Beyond his celebrated paintings, his tv series, children’s book illustrations, and public murals have earned national awards, grants and note-worthy commissions, including two Telly’s, 13 regional Emmies, an NEA grant, and a Zondervan publishing deal. He takes time to share wisdom gained over the last 20 years of Michigan-based creative endeavors. H.A.C.K. 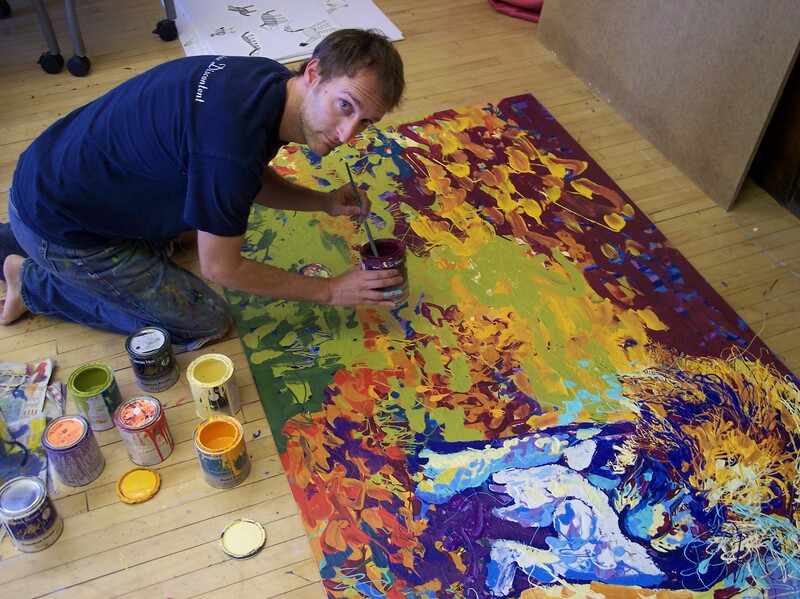 : Tell us a bit about the range of creative work that happens at Open Door Studio. H: How has sharing a studio affected your practice? What are you currently working on together? JEST: It’s nice to have another artist around for accountability. I might get into the studio and click on the computer to see what the Detroit Lions are up to (I’m a surprising fanatic) and he is painting and I realize, Oh, I should be painting too! It’s also just nice to have someone to share the burden of the artist life. He talks about “creative toughness.” We’ve both lived as artists for many years and it’s nice to feel a little solidarity in what can be a solitary life. We’re working on a few things together right now, but they are bigger projects that take a lot of pre-production so I can’t give you details yet (or my lawyer would get mad). Let’s just say one is a pretty cool kids media project. We’re also getting set up to take elaborate photographs…carefully planned, constructed scenes/portraits. H: There are artists who do “projects,” tackling bodies of work that revolve around a topic or theme. Then, there are those artists whose life work is about finding that one path of exploration that continuously captures their imagination. It seems you’ve found a way to do both—chase after that sustaining work and open yourself up to collaborative and public projects. Do you see this multi-facetedness as a necessity in terms of paying the bills, stimulating creativity, both? JEST: Certainly both. Through my entire career, I’m always drawn back to watercolor painting – the ones that juxtapose (my favorite artsy fartsy word) “real” images with “child-like” images. I find that to be an endless well. That said, if all I do is work on those paintings, it can start to feel like a job. That can make the creativity feel a little stale. Plus, my goal has always been to be smart about the business, but keep my heart away from being suffocated by the idea of this being about making money. So, that’s where taking on broader projects has helped, both creatively and as a nice bi-product, with the business. 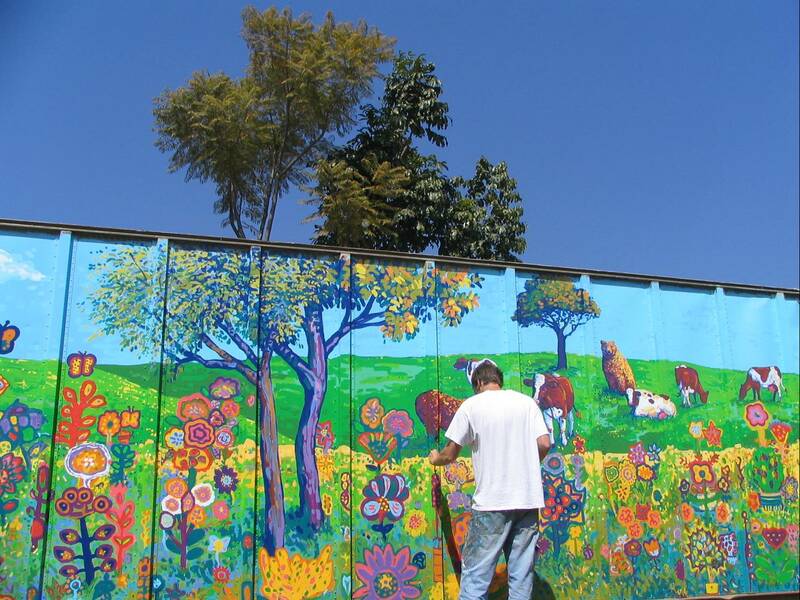 I love doing public murals. I often do these collaboratively with massive groups of kids. The last couple of years I’ve worked with the University of Wisconsin on a project called The Big Read. It’s an NEA grant that has me help groups of kids dig into literature by thinking like illustrators. Last year we did Poe. This year it’s Mark Twain. These big, collaborative projects are especially exciting because of what you see in the kids – it’s incredible to watch kids discover and flourish while being creative. H: How do your various creative endeavors—the tv series, commissioned murals and illustrations, paintings—inform each other? Is there a common denominator you see as most necessary for providing the bulk of stylistic or thematic inspiration? JEST: The obvious answer would be “kids”. Much of my work appears to be aimed at children, and so whatever the angle, or medium, it will inform the next. That said, I think what I’m more interested in is thinking like a kid. Do you see the difference? It’s not about the audience as much as the attitude. If I can think with the freshness of a kid, then I can reach kids but I can also offer that freshness to all ages. You know, a lot of my work has a faith element to it, and that’s where I especially like to capture this…you know, “faith like a child”…help people reconsider stories they’ve maybe heard before. H: What routine, art-related task do you find particularly time-consuming and draining? JEST: If it’s purely “art” we’re talking about then drawing can be that for me. I love painting…but drawing is a necessary and difficult part of the process. Otherwise, in the “art-related” category I’d say it’s the marketing of my art. I’d rather just hide in my studio and not worry about sales. I often wonder what it was like for the artists who were hired by royalty or the church and wonder if there’s still opportunity for something like that. H: For those unfamiliar with the Come on Over tv series, tell us a bit about that project—what inspired it, how it was made possible? JEST: COO grew out of my desire to reach more kids with a creative message (I often work with kids in schools when they bring me in to talk about my book illustrations). The show models creative play. I developed it with the GR Children’s Museum and a bunch of generous investors. I play sort of a hyped up version of myself and other characters “come on over” and play through all sorts of themes. There’s an entire episode where we play with tinfoil for instance. It’s not a “craft/how to” show…it’s more of a “look at these silly people playing and singing” show that hopefully inspires kids to go play on their own. Last year, Zondervan Publishing picked up the rights to distribute the DVDs. That gave me a great opportunity to create some additional content that draws out my Christian worldview. I believe part of being made in “God’s Image” is that we’re all inherently creative. That’s one of my Life’s Soap Boxes. H: You mentioned that in college, some of your classmates called you a “pop artist,” as a criticism for making work that had popular appeal. You continue to make work that most would agree is cheerful, whimsical, playful – has that criticism continued to follow you? How might you advise other artists who face similar branding while striving to remain true to their own visual language? JEST: I feel like the best art communicates something. We can best communicate that which represents us. If you happen to be colorful and whimsical, well then you have to go with that. It’s an integrity thing. H: In many of your paintings, you include a childlike scrawl that acts as a narrative device or caption. 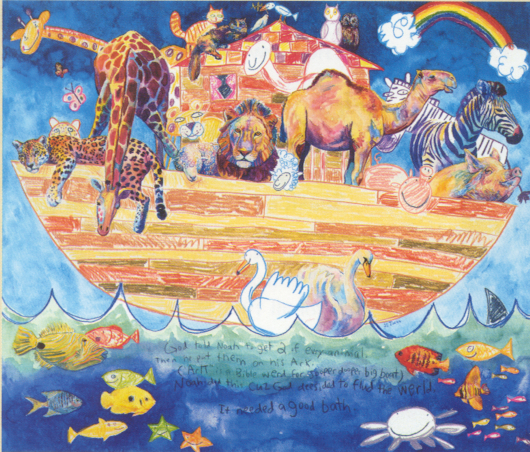 For example, in the painting depicting the Biblical story of Noah’s ark and the flood, you write on the bottom, “God desided to flud the werld. It needed a good bath.” Why the kidspeak? Is there an effort to disarm or simplify what’s actually a difficult story of God, the creator, destroying his creation? JEST: I sort of talked about this before, but it’s really an effort to take a child-like approach to help us see a story with fresh lenses. In the case of this piece – the world was rotten and needed to be cleaned up. I’ve done a few strongly environmental pieces before too on tough subjects (like the killing of tigers or rhinos) and hopefully the kidspeak helps disarm the viewer and consider the topic. Plus, I just like the whimsy of the kidspeak. I like making people smile or laugh. H: While your work might have popular appeal stylistically, you tackle some theological and spiritual issues themes that are not necessarily popular in contemporary art culture such as the veracity of Scripture, the existence of God, the Biblical creation account, sin. I wonder if your work ever ruffles the feathers of those who might see a Sunday School varnish on complex issues. JEST: Yeah, it’s funny. Over the years I’ve gotten it from all sides. I’ve had Christians upset that I am making scripture into punch lines. Others dismiss me as a “kid’s illustrator”. I think I have won over people from both of those critical camps when we interact. Christians see the “seriousness” with how I take my faith, and the culture snobs see the “seriousness” with how I approach the art. Whimsy is a serious discipline! But mainly I just try to be true to what I do and let it land where it does. Part of being an artist is putting yourself out there. There’s even that element of excitement that comes as other people add their worldview into what they are seeing…I’ve had all sorts of cool interactions with people who are moved in a way I never intended but that is very real. H: There seems to be an urge to teach, or to guide your viewer. You do this on various levels—one voice seems to be that of a child on a playground telling his friend some exciting news he heard. This takes its form in the scribbled text and youthful drawing styles. Then, adult wisdom creeps in with reassuring morals that are paired with the impressionistic renderings of somber animals. Where does that urge come from? JEST: I think it’s that urge to communicate. It’s funny, I’ve actually been experimenting lately with removing the “text” and see if I can still communicate the message and the whimsy. That’s still a process I’m wrestling with. H: If you could collaborate with any individual or group of individuals, who would you team up with? What kind of project would you tackle? JEST: I’m so wide open on this. I’m always open to the next collaboration given that we share common ground in the theme. That said, I love the idea of doing projects that have multiple art forms woven into them. I’d like to work with Lyle Lovett on a story, song, art piece, improvisational dance…something like that.